Casey Nelson Assigned to Rochester, Hall of Fame Night Preview · Let's Go Amerks! It’s a Friday in February which means it’s time for the Rochester Americans Hall of Fame night. 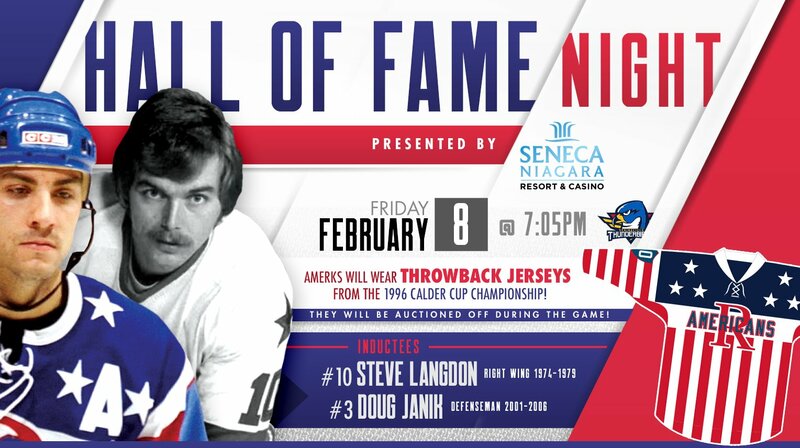 The Amerks will induct Doug Janik and Steve Langdon into the Hall of Fame this year. It’s also throwback jersey night to the old stars and bars with the “R” in the center. As players were shown the jerseys there was genuine excitement for the look of these. A different reaction from many special jerseys that are worn. The common thought was that the team should wear them more often. The last time they were worn was during the 2010/2011 season when Chris Taylor was still a player. The other big news of the morning was that the Buffalo Sabres assigned defenseman Casey Nelson to Rochester on a conditioning loan. A player can be in the American League for a maximum of 14 days when assigned for conditioning. Nelson spent the better part of the previous two seasons in Rochester playing a combined 98 games. In those games he had 32 points (9G+23A). Even though he’s been with the Sabres all season he’s stayed in contact and is aware of how well the Amerks are playing this season. He talked to Chris Taylor about playing time and said that Taylor jokingly told him he’s playing 30 minutes. Nelson last played on December 4th and has been out since with an upper body injury. Nelson will be playing for an Amerks team looking to beat a team that embarrassed them the last time they played. The last game against Springfield was a 9-4 loss on November 16th. Springfield score seven of those nine goals in the second period. A game that the Amerks locker room would love to forget but hasn’t. Rochester only had possession of the puck in the offensive zone for approximately 68 seconds. That isn’t an official number but close enough after going back and watching the game with a stop watch. It all came down to the classic 50/50 battles, battles that Syracuse won every single time in a 20 minute span. Chances are that Guhle and Nelson will be paired up on defense like they had been last season. Zach Redmond is close to returning to game action but isn’t quite there yet. He did not participate in the teams morning skate. Alex Nylander is still out as well since being hurt in practice on Tuesday. Nathan Paetsch, Dalton Smith, Brandon Hickey, and Andrew Oglevie (still no contact) were the players that remained out for extra skating time. Scott Wedgewood is expected to get the start in net and likely hopes of getting some extra help in front of him.